Maine Gov. Paul LePage used what many believe was racially charged language during a town hall meeting Wednesday, when he claimed that people with names like "D-Money," "Smoothie" and "Shifty" were coming to the state to sell their heroin and impregnate a "young white girl before they leave." According to CNN, the comments came after LePage was asked what the administration was doing to stop drugs in the area. "These aren't the people who take drugs," LePage said, in comments first reported by the Portland Press Herald. "These are guys with the name D-Money, Smoothie, Shifty. These type of guys. They come from Connecticut and New York, they come up here, they sell their heroin, then they go back home. Incidentally, half the time they impregnate a young white girl before they leave, which is a real sad thing because then we have another issue we've got to deal with down the road," the governor said. 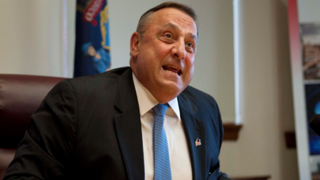 Peter Steele, a spokesman for LePage, told CNN that the governor wasn't singling out any race but was addressing the issues of drug trafficking and kids who are born as a result. "The governor is not making comments about race. Race is irrelevant. What is relevant is the cost to state taxpayers for welfare and the emotional costs for these kids who are born as a result of involvement with drug traffickers. His heart goes out to these kids because he had a difficult childhood, too. We need to stop the drug traffickers from coming into our state," Steele said. According to CNN, Hillary Clinton's presidential campaign was one of the first to call LePage's comments "racist rants." "Gov. LePage's comments tonight are not only offensive and hurtful, but they try to cover up the very real epidemic of drug abuse facing people in his state and across the country," Marlon Marshall, director of states and political engagement and a top African-American staffer for the Clinton campaign, said in a statement. "LePage's racist rants sadly distract from efforts to address one of our nation's most pressing problems." Read more at CNN and the Portland Press Herald.